With the 2.7.0 release of Hadoop, Hadoop now includes the ability to connect to a Windows Azure storage account. There are plenty of advantages to this, including the ability to tap into the resources of Azure for storage. To be fair to other cloud providers, there is also support for Amazon S3 and OpenStack Swift, but this post is specifically to discuss Azure. For the first requirement (Hadoop 2.7.0), you can follow the existing instructions on this site to set up a Hadoop cluster. 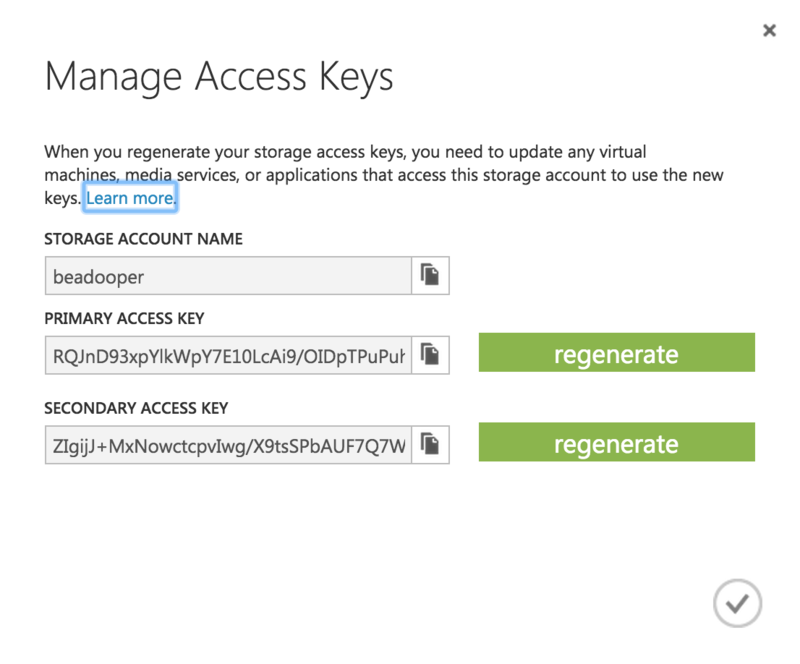 For the second (Windows Azure and a storage account), see below. The first Tb (terabyte) of storage costs $0.024 per Gb as of the time of this article. That’s $2.40 a month for 100 Gb of storage. It’s obviously much cheaper if you are only messing around with a few Gb of storage. Beyond that, the price per Gb goes down. Log in to the management portal at https://manage.windowsazure.com. Select a location in the Location/Affinity Group section. You can use the default or pick a region that is close to you. For Replication, select “Locally Redundant” for the lowest cost. If you are concerned about the replication of your data, you can select one of the other options, but they come at a higher cost. It’s important to note that you are not charged if you do not keep data in your account. Charges are pro-rated by month as well. Once the text “Online” shows in the Status field for your storage account, your storage is available for use. To get started, click on your storage account, then from the initial “Your storage account has been created!” screen, click Containers. On the Containers tab, click Add to create a container, and then specify a name for your container. From this part of the UI you can’t create your own data under the container, but we will be doing that from Hadoop soon. Your keys will obviously look different, and these aren’t the beadooper account keys anymore…they were regenerated after taking this screen capture. Why are these keys so important? They are like passwords. having the key and the account name gives someone access to all of the data in the storage account. Azure does have more advanced controls to help to secure access to the data, but for this discussion, we are showing how you can access the data in your storage account from Hadoop, and we will also discuss securing the key in your Hadoop config. The key thing to remember now is that the access key is what you use in the Hadoop configuration to access your account. Clicking the paper icon next to the access key will put the key on the clipboard. Put the key configuration in the core-site.xml file. Update for your specific version and the location of these files. All this is doing is adding hadoop-azure-2.7.0.jar and azure-storage-2.0.0.jar to the classpath. Replace YOUR_ACCOUNT_NAME with your account name and YOUR_KEY with your storage access key. 15/06/21 19:17:31 INFO impl.MetricsSystemImpl: Scheduled snapshot period at 10 second(s). 15/06/21 19:17:32 INFO impl.MetricsSystemImpl: azure-file-system metrics system stopped. 15/06/21 19:17:32 INFO impl.MetricsSystemImpl: azure-file-system metrics system shutdown complete. 15/06/21 19:23:10 INFO impl.MetricsSystemImpl: Scheduled snapshot period at 10 second(s). 15/06/21 19:23:11 INFO impl.MetricsSystemImpl: azure-file-system metrics system stopped. 15/06/21 19:23:11 INFO impl.MetricsSystemImpl: azure-file-system metrics system shutdown complete. Note: The trailing slash after .blob.core.windows.net is important…without it, you get a “no such file or directory” error. Now you can use -mkdir, -put, or any other file system commands to access Azure like an HDFS file system. Before you roll this out on your production cluster at work, keep in mind that when accessing Azure in this fashion, there is NO security related to user permissions applied…effectively, anyone accessing the file system has rights to this data as the main hdfs user in Hadoop…but only for this file system. The idea behind this is that Azure assumes authorization is handled by controlling access to the key. I don’t particularly agree with this statement and think that Azure should support additional permissions checking, but that is the current state of the security model at the time of this post. So by specifying ShellDecryptionKeyProvider in the fs.azure.account.keyprovider.YOUR_ACCOUNT… property, you can enable the actual key to be provided to Hadoop with the encrypted key passed in to the script specified by fs.azure.shellkeyprovider.script. Note: Even though the documentation(as of this post) mentions you need to set the property fs.azure.account.keyprovider.YOUR_ACCOUNT, you actually in fact need to specify the full DNS name of your storage account, including .blob.core.windows.net. This will then look in a directory named .azureStorageKeys for a file with the same name as the storage account, thus allowing keys to be secured using Linux file system permissions. This by itself may not be a practical example for a multi user system (since keys should be distributed to common areas and not recreated in every user directory), but it illustrates all of the mechanics regarding how the key provider script works. All in all, I would exercise caution on using Azure connectivity for a production cluster where security of data is important. Further updates could improve the security of the connection in addition to other security features in Azure. Regardless, knowing how to get data in Hadoop to and from Azure is a useful tool to have in your toolbox in case your organization uses Azure.